KK1173 Blanco Encalada, Chile 400m. It may be recognized for the long white hairs under the flowers (particularly conspicuous in mature flowering specimens). Habitat: Coastal areas, 0 - 500 m. with coastal fog (camanchaca)The plants obtain water mainly from condensation. 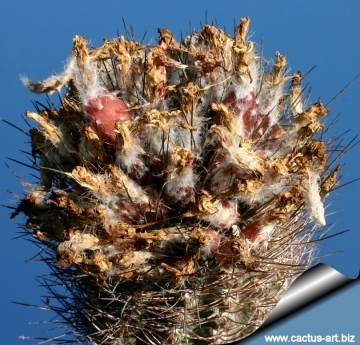 Description: Solitary, fiercely spined cacti with abundant white wool on top and long white hairs under the flowers . Stem: Up to 15 cm in diameter. Dark green, tan to grey-purple tinged stem. Ribs: Adult specimens have up13 notched ribs, forming tubercles with sunken areoles. 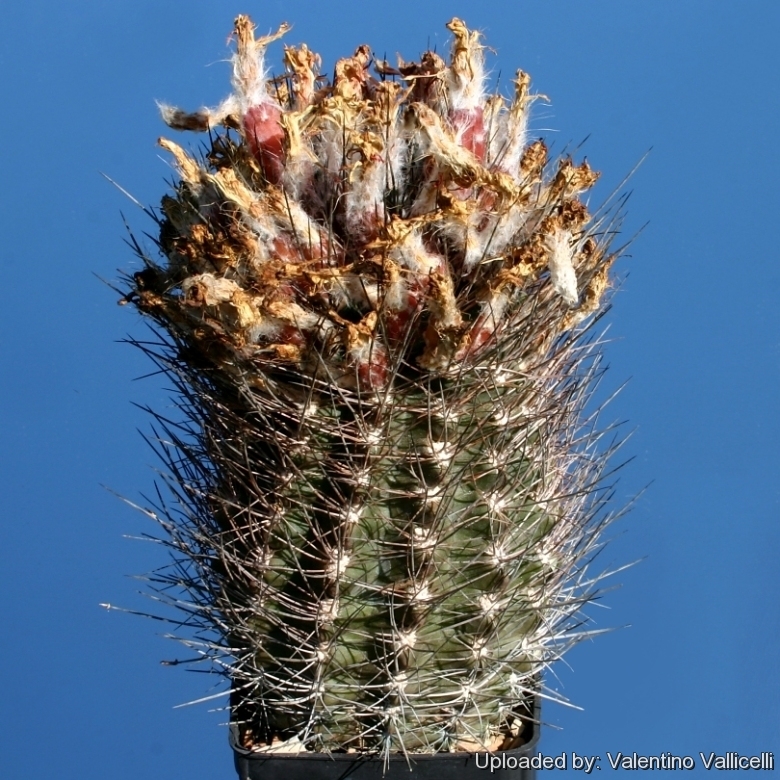 Spines: Juvenile specimens have only few spines, but the numbers increase as they get older, and areoles can have over 20 spines on mature specimens. Dark brown to black, soon becoming chalky-white or greyish, up to 30 mm long. Flowers: Reddish, pinkish or yellowish from apical areoles, campanulate or funnel-shaped, about 3 cm in diameter. Floral tube with abundant white wool and bristles. There might be over 50 flowers on a mature specimen (only mature specimens bloom). Cultivation and Propagation: Eriosyce eriocephala is a slow growing but relatively easy to grow species, providing they are kept dry during autumn and winter and rot prone if kept in a non ventilated place.